Space per pupil: 920 sq.ft. The Blue Wall in the Lincoln Campus Center is an exciting new dining experience. 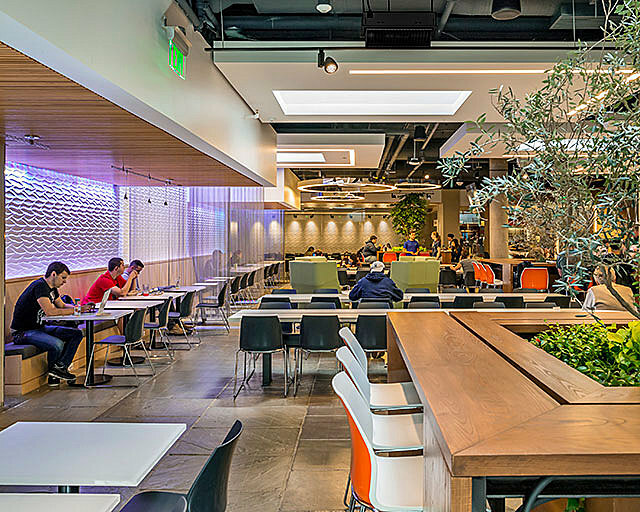 Divided into three distinct restaurant seating environments, it is modeled after successful retail urban marketplaces like Eataly in NYC, where fast turnover, high-taste food profiles, and a distinct urban vibe are key elements. The East Dining area has white-washed wood plank tables and is dominated by Asian food offerings and a view to the lawn outside. 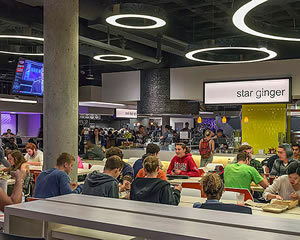 The center Marketplace section of seating is darker and offers traditional and local food eaten under a series of false sky-lit rooms divided by translucent stainless mesh curtains. 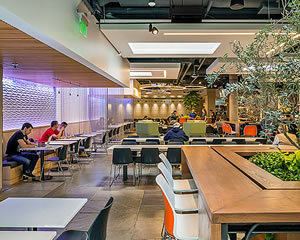 The West Dining area is dominated by natural light, a converted indoor light court, and tables gathered around trees and plantings to facilitate either comfortable single diners or large groups of twelve to gather under their canopies. Inspired by European restaurants, the project involved the total renovation and reconfiguration of the existing dining presentation, service, and environment, as well as new exhibition cooking, enhanced meal offerings, flexible seating arrangements, and new interior finishes. 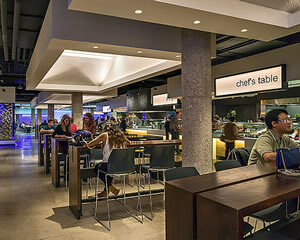 The renovated and rejuvenated space creates a casual urban dining experience that seamlessly blends the old with the new. 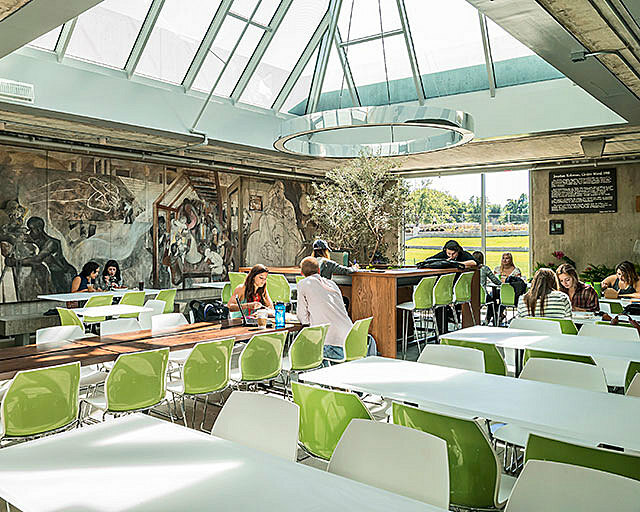 An abundance of natural light, increased transparency, and custom LED lighting improves the overall ambiance and allows for flexible seating, quiet study and lounge spaces, and a more engaging connection to the outdoors. The project was not without its challenges, including accommodating 1,500 additional visitors per day in 25 percent less footprint, creating a world-class venue, and raising revenues by double digits. The Bruner/Cott team approached both the technical and operational goals with careful consideration, using various LEAN design techniques developed by the auto industry for reducing waste to devise techniques to achieve the desired outcomes. All the above goals were met or exceeded. The design embraces the challenge of its underground location, and is lit more like an elegant urban restaurant or a stage set. 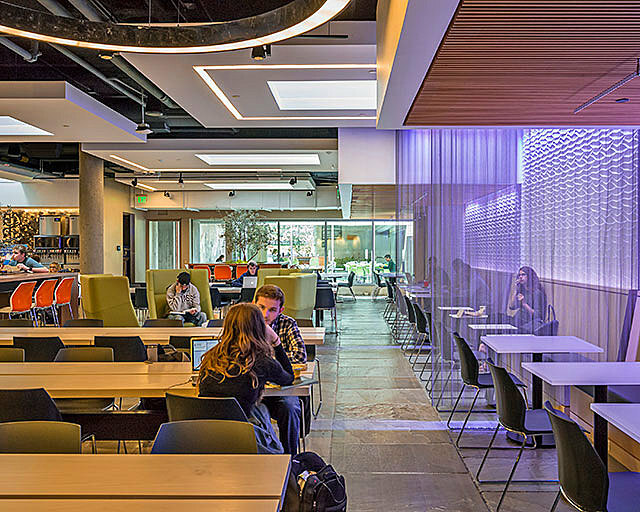 Using a palette of neutral colors and light-reflective materials, colored light-washed walls of textured tile reflect color and light deep across the 300 foot long space. Black stainless, pearlescent and chrome-plated tiles and polished concrete floors add texture and reflect light everywhere. 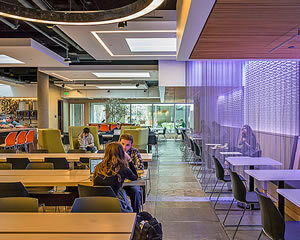 Color infuses the space through furniture and light accents alone, allowing dining services to change the mood of the space by lighting in the short term, or replacement of the chairs in the long term. 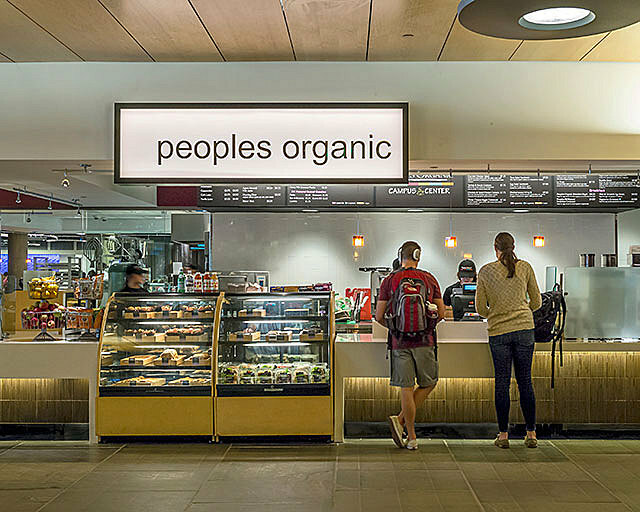 The food venues where purposely designed to be flexible for future changes in menu and food preparation, therefore signage and materials stay in the neutral palette as well to allow the food to be highlighted and the architecture to feel unified from one restaurant to the next. The finished kitchens, serveries, and dining spaces were designed according to LEED CI Retail guidelines and include: energy and water-saving equipment; demand-control ventilation systems; kitchen exhaust air scrubbers; LED lighting; food pulping and composting; recycling; and sustainably-design, low-VOC furnishings and finishes. European standing tables incorporate a dual height design that accommodates people of all sizes and heights. All venue countertops are set at ADA height and eliminate tray slide zones for barrier free access. Comfortable reach limits on all equipment and food displays allow for easy user access at any height.Polished concrete floors, porcelain wood plank tiles, ash, resin, and quartz solid surface tabletops and counters with distressed steel frames, black stainless and mirror-plated ceramic tiles, pearlescent three-dimensional tile, acoustical wood grille ceiling systems. 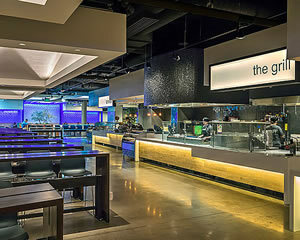 Located at a major crossroads of a major public university campus, the Blue Wall Dining is in close proximity to the Lincoln Campus Center Hotel, a parking garage, and regional public transit. Numerous walking paths connect also connect it to the rest of campus. The architects created high-turnover seating options including tall tables with stools and European standing tables, fixed tables to the floor to keep order, and redesigned the venue layouts to include 22 points of sale. The new circulation strengthens connections. Construction/Project Management: Lee Kennedy Co.